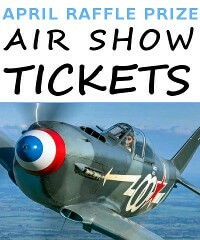 Abingdon Air Show has kindly offered entry tickets to the May 2019 Air Show as the raffle prize for April 2019. For details, scroll to the foot of Kidlington Voice Online. Please help yourself to a free raffle ticket at the top-left of KV's home page. Who has won a KV raffle prize this year? March 2019 saw a long-time resident of Kidlington Village, Fliss Emptage, win a copy of the book 'Kidlington Village - it's story so far' written by local historian John Amor published and offered by the Kidlington and District Historical Society. February 2019: a bottle of fine wine - labelled to commemorate 800 years of Kidlington history - was won by local resident Edmund Hunt. January 2019: the draw for a bottle of wine donated by Kidlington's micro-bar DrunkDry Ltd was won by village resident Margaret Boggs. Would your organisation like to donate a raffle prize? If your own local organisation would like to offer a prize for a monthly draw on Kidlington Voice Online, then please contact louise.lloyd@kvoice.co.uk. August 2019 free draw: tickets to the September performance at Exeter Hall of Kidlington Concert Brass. September 2019 free draw: Kidlington Amateur Operatic Society's October performance at Gosford Hill School of Kiss Me Kate.